We spend a lot of time on our computers these days than we used to, only a few years back. And I’m sure almost all of you will concur with me that a major chunk of that time goes towards browsing the web. And that shouldn’t be surprising, as there are a number of websites and/or web-based applications, such as email and cloud storage services, that we need to access on an almost daily basis for our productivity needs. That being said, most of these web based applications require/tasks us to enter a username and password combination. And given the fact that these tasks include everything, from important emails to banking transactions, makes these passwords all the way more important. But with the number of passwords that an average user has to remember growing larger by the day, managing them has become a major pain. Fret not my friend, as there is no dearth of some really great password manager applications out there, and they let you handle all those asterisks like a champ. Excited already? Let’s find out more about 4 best password manager software for Windows 10. Although Dashlane boasts more features that you can possibly explore in one go, I personally like the uber-cool UI the most. No seriously, it is incredibly gorgeous. But Dashlane is much more than just a pretty face. Arguably one of the most powerful password manager applications that you’ll find, Dashlane lets you add nearly unlimited passwords (along with associated information, such as usernames, URLs, and more) to a secure database. You can also assign each password entry to one of the many categories (e.g. business, entertainment). Think that’s all? Not at all. Thanks to native integration with almost all major web browsers (Internet Explorer, Firefox and Chrome), Dashlane can automatically enter your saved login credentials on the specified web pages, all in one click. In addition to passwords, the application can also be used to store secure notes, electronic payments (made via debit/credit cards), and electronic receipts. But there’s more. You can enter your personal information (name, email, DOB etc.) in Dashlane and it’ll automatically fill it up when you’re creating accounts online. And if all of this isn’t enough, this thing can even sync your saved credentials to your free Dashlane account, so they are available across multiple devices (although this requires you to upgrade to the paid version). It doesn’t have the fancy buttons and eye candy menus like the ones Dashlane sports, but then, KeePass doesn’t need any of these. That’s because it lets its features do that talking. 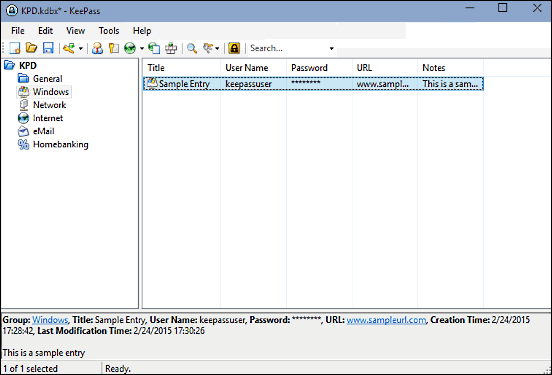 And believe me, KeePass has a boatload of impressive features that make it, well, plain incredible. The lightweight open source application lets you save all your passwords in a locally stored database file, secured by a user specified master password, and encrypted using AES 256 encryption algorithms. In addition to that, the whole thing is also protected by an additional keyfile. You can either choose any existing file of your choice as a keyfile, or have KeePass create one itself. 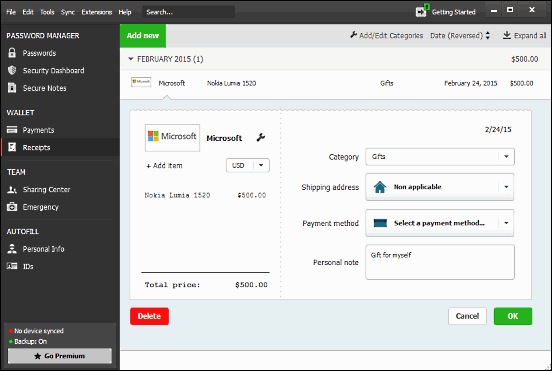 Once an encrypted database is created, you can start saving and organizing your passwords instantly, using automatically created groups/categories, such as General, Windows etc. And of course, you can create new groups of your own as well. With saved passwords, you can add a ton of information such as username, quality of password, URL, additional notes, and expiration time/date. Apart from all this, KeePass also includes a built-in random password generator. And did I mention it’s portable? Want an application that can take care of all your passwords without requiring you to configure an endless array of settings? Looks like Free Password Manager is just the thing you need. 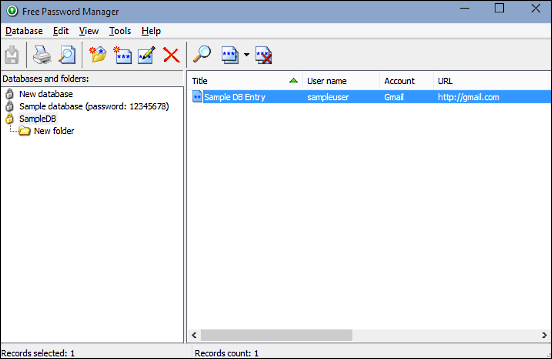 As the name suggests, Free Password Manager is a gratis password management application that lets you save all your important credentials in a locally stored secure database. The created databases (and their contents) are secured using AES256 level encryption, and can be only accessed via a user specified password. The application can be configured to automatically backup the databases. In addition to that, Free Password Manager can also close open databases automatically, after a specified duration of inactivity. You can save as many password entries to a database as you want, and each entry can consist of a number of fields, such as username, URL, and account name. The entries added to a database can be further organized in folders and subfolders. 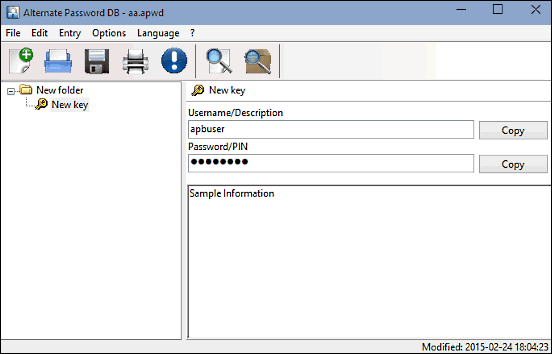 Closing things off is Alternate Password DB, a simple and to the point password management application. While it may not be the most feature laden password manager out there, but it does all the basics right, and does them extremely well. The working of the application is pretty simple, and thanks to the minimalistic UI, it doesn’t really take much time getting a hang of it. Alternate Password DB lets you save as many username and password combinations as you want, and you can (optionally) add helpful notes to the entries as well. Although the database files are not encrypted, they are still protected with user protected passwords. In addition to that, the application itself can be locked with a separate password as well. You can also configure Alternate Password DB to automatically lock itself after a specified period of inactivity. And it includes a random password generator too. Almost all of us have to keep track of a ton of different passwords, thanks to the increasing number of web based services that we use daily. And that’s surely not an easy thing to do. But thanks to some really great password management applications, like the ones discussed above, you can manage and organize all your passwords with no problems at all. Take these for a spin, and let me know your favorites in the comments below.